Are you the type of person who has to religiously read online reviews before you set food into a restaurant? It turns out you’re not alone. Millions of people flock to review sites like Google, Yelp, TripAdvisor, and even social media sites like Facebook to see if a new restaurant is worth trying, what their best dishes are, or whether or not you should avoid it like the plague. Research shows that the average person reads about seven reviews before making their decision to visit a business or not. But are all reviews and review sites created equal? What’s really behind the ratings and reviews that we rely on for information about all of the new restaurants and bars? In order to better understand the rankings and platforms used to publish them, we used Eater.com’s “38 Essential” lists and analyzed 4,000 data points across Google, Yelp, Facebook and TripAdvisor. Let’s take a look at what we found out about restaurant ratings—and which places in the world are the most opinionated. Out of the review sites that we looked at—Google, Yelp, Facebook and TripAdvisor—we noticed some telling patterns among them. The site with the highest ratings overall was social media giant, Facebook. Interestingly, the site with both the highest number of reviews and the lowest ratings was Yelp, which could mean that the majority of online reviewers are fairly critical. Finally, the site we found with the lowest number of reviews is TripAdvisor. We all have that one friend who never seems to be impressed with any restaurant, but are there whole cities filled with these types? We looked at the average ratings across Google, Yelp, Facebook and TripAdvisor to get a sense of which 25 cities around the world were the most critical of their local restaurants online. And which cities in the world have the best-rated restaurants? According to our data, the best-rated restaurants were all in Charleston, Denver, Boston, San Diego, and Seattle. We also wanted to look at which cities were the most opinionated. In order to determine this, we examined the average number of reviews across Google, Yelp, Facebook, and TripAdvisor. The most opinionated city according to our data is Chicago, who had the most reviewed restaurants out of all the cities in the world. New York took the no. 2 spot, followed by San Francisco, Las Vegas, New Orleans, Washington D.C., Los Angeles, San Diego, Nashville, and Houston came in at no. 10. In order to get an even better understanding of ratings and reviews, we wanted to look at the data by review platform to see if this changed any of the results that we found overall. We took a look at the highest ratings, lowest ratings, highest number of reviews, and the lowest number of reviews for Google, Yelp, Facebook, and TripAdvisor—and we found some pretty interesting patterns. On Google, the three cities with the highest rated restaurants were Philadelphia, Seattle, and Charleston (which was fairly consistent with our overall findings). The three cities with the lowest rated restaurants on Google were Paris, London, and Montreal. Coincidentally, London and Paris also accounted for the cities with the lowest number of reviews on Google (in addition to Denver). The cities with the highest number of reviews on Google were Chicago, New York, and San Francisco—very consistent with our overall data. On Yelp, however, we found almost entirely different results. The cities with the highest rated restaurants were Charleston, Paris, and Nashville. We also found that Paris was one of the cities on Yelp with the lowest number of reviews, along with London and Montreal. 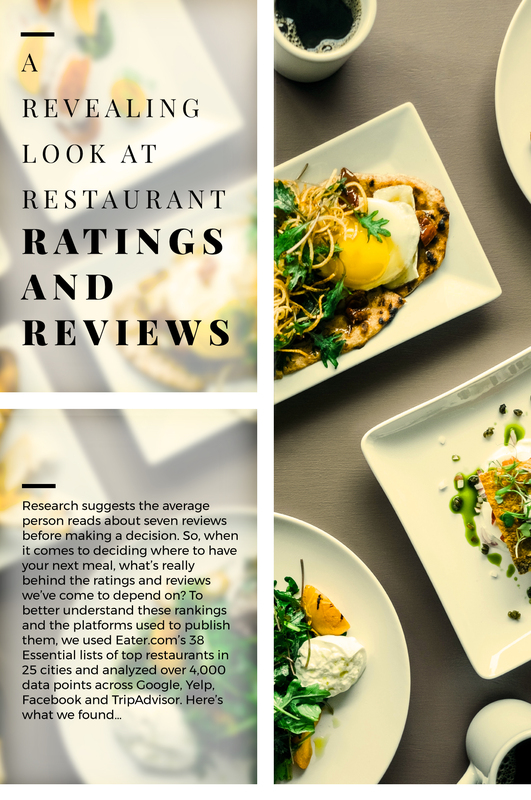 Interestingly enough, we found that there were some parallels drawn between the cities with the lowest rated restaurants and the highest number of reviews on Yelp. Los Angeles was one of Yelp’s cities with the lowest rated restaurants but it also had the highest number of reviews. San Francisco also had the no. 2 spot for cities with the lowest rated restaurants and claimed the no. 3 spot for the highest number of reviews on Yelp. We also found that New York was listed in the cities with the lowest rated restaurants and Chicago took the no. 1 spot for the highest number of reviews, keeping consistent with our overall data. Facebook also yielded some different results from Yelp and Google. The cities with the highest rated restaurants were Denver, Paris, and Seattle—similar to our overall best-rated restaurants list. The cities with the lowest rated restaurants were Washington D.C., Portland, and San Francisco. The cities with the highest number of reviews on Facebook were Chicago, San Francisco, and New Orleans, which all came fairly close to the overall data. And the cities with the lowest number of reviews were London New York, and Paris. This is certainly an interesting find, as New York has the highest number of reviews on Google. Finally, TripAdvisor also had completely different data outcomes. The cities with the highest rated restaurants on this review site were Charleston, Boston, and Detroit—which at least had Charleston in common with Yelp and Google. The cities with the lowest rated restaurants were London, Montreal, and Washington D.C., producing similar low rated restaurant results to Google. On TripAdvisor, the cities with the highest number of reviews were New York, New Orleans, and Las Vegas—which all came in on the top five on our overall data. The cities with the lowest number of reviews on TripAdvisor were Denver, Detroit, and Seattle, which might explain why Detroit cracked the top three for highest ratings.